A ccording to labour theory of value, developed by classical economists particularly David Ricardo and Marx, the value of a goods (price or exchanged value) reflects the amount of labour, or labour power, needed for their production. The Marxist economists declines any real productive role to capital while focusing on a fact that all profit derives from unpaid labour of exploited worker. Rivera was an active communist and founder of the Revolutionary Union of Technical Workers, Painters and Sculptors. His large-scale labour murals painted in Mexico and USA depicted different aspects of physical labour (industrial, agricultural, artisanal), and portrayed the class struggle of the workers. 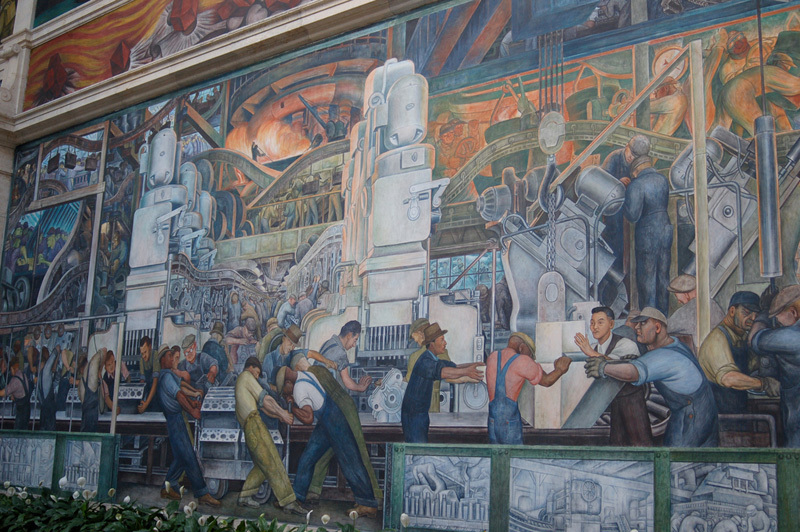 Henry Ford commissioned “Detroit Industry” from Rivera at the height of the Great Depression. The twenty-seven fresco panels, dedicated to the American worker, were painted upon a study of accurate working process in a Ford Motor plant. Right after the completion, murals were viewed by 20,000 people a day. During the McCarthyism (1950s), the murals were kept from harm by a sign upholding the artistic merits of Diego Rivera's work. “For the moment, I think it’s useful if we adopt position of Marx and see what forms us. When we discuss Marx, what forms your personality is class. That means how you earn your living. As we produce objects, we produce ourselves. I’m not aiming that Marx has all the answers, but he is right, this is the key element. How you work, for whom you work, has a lot to do with who you are. So, class access is a constraint in that way, even for those who we think of as little freer from constraint because they are higher in a hierarchy. I’m reminded each day by my work that my personality doesn’t matter. That I’m made and remade by that work for the interests and profit of others. Let me remind you again what Marx means about the alienation. Your labour is taken from you, well, actually it isn’t taken from you, you sell it, but the way you sell it will make others more powerful over you. REF -> Transcript: Jay Cantor teaching class on Marx, the documentary Theater of War (2008). Directed by John W. Walter. Staring: Meryl Streep, Kevin Kline and Tony Kushner. A behind-the-scenes look at The Public Theater's production of Bertolt Brecht's play Mother Courage and Her Children.